There are several exchanges planned for the course of the project. Many of them include primary school children. Pupils learn first hand about different cultures, experience the natural environment and get motivated to promote the outdoors in their families and classes. In the Alojzij Šuštar Primary School we find it really important to stay connected with nature. We believe it is our calling not only to teach the kids about nature but also to really make them appretiate and respect it, be inspired by it or even in awe of it. We realise that with the technological advances the usual backyard playgrounds are dissapearing and it is also up to schools to get children to enjoy outdoor activities. So this is one of the many projects (mainly local or national) that we take part in. Teachers attend several classes and courses on outdoor education, an outdoor classroom was constructed ni th eimmedate vicinity of the Alojzij Šuštar Primary School and we are constantly developing new ideas on this subject. At Alojzij Sustar Primary School we have successfully finished a two-year Outdoor Learning project in which we cooperated with two partners, Borge skole from Fredrikstad, Norway and Slovenian Catholic Girl Guides and Boy Scouts Association. There were 5 exchanges of staff and pupils during the project, and we have immensely improved the outdoor learning methods and techniques. We have also improved the outdoor learning classroom where we have built many playing equipment, planted new plants and gardens, bought numerous tools which we all use when having lessons and other activities outdoors. We even have two sheep in the outdoor classroom which our pupils take care for. In this school year, we are planning to build a traditional Slovenian hayrack called »toplar«, so we can learn outdoors during cold winters. On the academic level, we organized and held two major events. 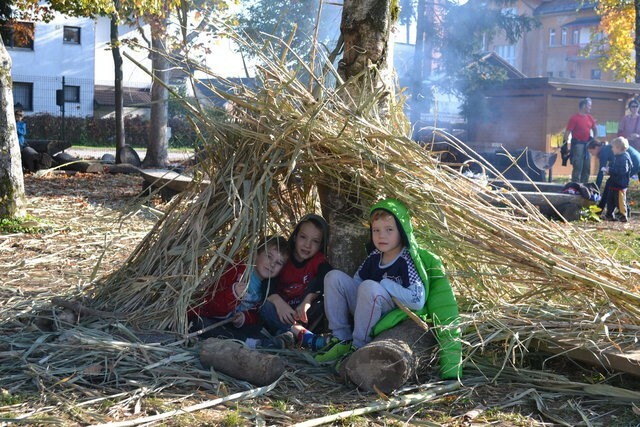 The first one was a national seminar named Učilnica v naravi (Outdoor Learning) in March 2015, where 30 teachers and pedagogic workers from all over Slovenia came to listen to lectures and try out some outdoor activities. In October 2015, we organized an international conference Outdoor Learning. The main speaker was Jan Kare Fjeld, a teacher and outdoor activities coordinator at Borge Skole in Fredrikstad, Norway. Around 60 people participated at the conference. We cooperated with many other faculties, organisations and institutes that are involved in outdoor education. Both events were a great success and the participants were thrilled about the knowledge they gained on outdoor education.